Your ART HUB is a fundraising event for this arts meeting place. * Contemporary art fair - 19th-30th of September 2013 with over 100 paintings, drawings, objects by professional artists such as: Elena Andrei, Ana Andronic Buzu, Otilia Cadar, Sorin Dan Cojocaru, Adela Edu, Teofana Filip, Paul Hitter, Cătălin Lartist, Maia Ștefana Oprea, Valentin Soare și Nona Șerbănescu. free entrance - donations appreciated! 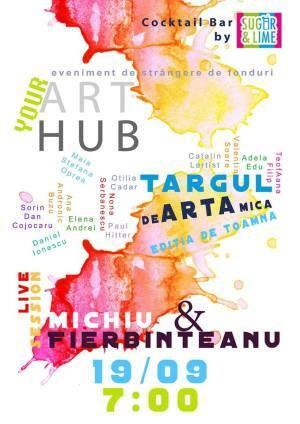 "Your ART HUB - Contemporary art fair opening" Fair in Bucharest. You can get here description, reviews, address, time and details of "Your ART HUB - Contemporary art fair opening" Fair in Bucharest. Visit Bucharest Tips for more Fair events in Bucharest!